Tactics 101 097 – The Light Infantry in Defense | Armchair General Magazine - We Put YOU in Command! In our last article, we focused on the light infantry platoon in offense. We drew on several previous articles which concentrated on the organization of the platoon and the maneuver formations and techniques it has at its’ disposal. Within our discussion, we keyed on three major parts. First, we provided an example of an attack gone wrong. Second, we dissected the lessons learned from the attack. Finally, we detailed how an attack should be executed and covered the “3 F’s” of an attack – Find, Fix and Finish. In this month’s article, we decided we would be a little more historically focused than normal. We will again look at the light infantry. This time we will address its use in the defense and provide several historical examples. We will specifically illustrate the light infantry defending a battle position, a strong point and a defense in depth. There are many great examples in history, but these came quickly to mind. Within these examples, there are plenty of lessons learned to go around. Let’s Move Out! “Don’t fire until you see the whites of their eyes” is the quote attributed to Israel Putnam during the Defense of Bunker Hill. ‘Old Put’s’ words were not only inspirational and heroic; they were practical in 1775 given the range and accuracy of the black powder, cap and ball, and the muskets in use. His admonition is all about concentration, fire control and distribution; keys to an effective defense. July 1950 (Task Force Smith). In late June 1950, North Korea invaded the Republic of South Korea (ROK) achieving total complete surprise. They quickly overran the unprepared ROK forces as they pushed south towards the Port of Pusan; South Korea’s lifeline. The US and UN responded by quickly assembling a Battalion Task Force to block North Korean movement southward. TF Smith arrived on July 1st and was dug in on two hills by July 4th. The hills straddled the North Korean axis of advance (AOA) 25 miles south of Seoul. The hills rose 300 feet above the road providing good observation and fields of fire. The TF placed its infantry on the hills with artillery in support; rain prevented close air support. On July 5th, the lead column of North Korean tanks ran into TF Smith. The tanks were impervious to the fires placed on them and TF Smith was quickly overrun and bypassed. The defense failed due to insufficient combat power, obsolete firepower and lack of preparation given the hasty nature of the operation. August 1950 (Pusan Perimeter). The North Koreans bore down on Pusan forcing the US and UN forces to defend the last strategic point in the ROK. As US and UN forces flowed in, this became a large-scale battle running from Aug 4 to Sep 18. The North Koreans had four penetration points to work: the two southern routes through Masan and the Naktong Bulge near Miryang; the northern route through Taegu; and the eastern route through Kyongju. All were covered and all were attacked. The US and its Allies used extensive preparation, intense fires, and internal lines of communication to successfully defend all AOA’s into the perimeter, thus buying time for the Inchon landing up north near Seoul. The defense succeeded due to the placement of forces and fires against all of the major AOA’s, secure flanks, interior lines, and an active logistics base reinforcing the perimeter from Pusan. November 1950 (Chongchon). The Inchon Landing achieved complete surprise. The North Korean Army began to disintegrate in the face of potentially being cut in two with the majority trapped in the south. They turned north allowing forces in Pusan to break out. What had begun as a rout of South Korea had now become a rout of North Korea. The Eighth Army, in the west, and X Corps, in the east, pursued the North Koreans past Seoul, across the 38th Parallel, into North Korea. As the Allied Forces approached the Yalu River, victory seemed certain. When forces stopped for the night, they tended to establish hasty defensive positions. Unfortunately, they didn’t know that the crossing of the 38th Parallel was a trigger for the Chinese to intervene in the war with massive amounts of manpower. In November 1950, the Chinese 13th Army Group attacked the ROK II Corps. The Chongchon River Battle decimated the US 2nd Infantry Division and threw Eighth Army into the longest retreat in US Army history. All along the front, allied units were dispersed and emplaced without decent early warning. The Chinese surprise was enhanced by poor preparation of hasty defensive positions by the allies. The defense against the Chinese attack was a loss due to poor preparation: flanks not tied in, communications not established, hasty positions, poor intel, and surprise. In just four months, the US and its Allies had suffered two defensive disasters bookending a brilliant defensive victory. A comparison of the three reveals the need to take defensive preparations seriously whether hasty or deliberate. Light Infantry Strengths. Light fighters are primarily offensive, but they can be lethal in the defense if properly employed. The light infantry brings numbers, yet remains a low signature, stealthy force that is hard to find when carefully placed. Light fighters are an all-terrain / all-weather force able to defend from difficult positions. They thrive on decentralized command and control, enabling them to distribute their forces to achieve their objectives through mutually supporting purposes or mutually supporting fires. They carry a formidable array of small arms, organic mortars, and plenty of AT systems that can layer any defensive position. Lastly, light infantry owns the night given their extensive night vision capabilities. Light Infantry Weaknesses. On the flip side, there are vulnerabilities that should be considered when placing light infantry in the defense. Although they are all terrain, they are foot mobile during the fight so their ability to rapidly reposition is based on their initial placement. They also lack armor protection and are vulnerable to enemy indirect fires when not in well-prepared fighting positions with overhead cover. They lack the ‘big guns’ of mechanized and armor units and their logistic support is wheeled and vulnerable to enemy fires. This necessitates the need for caches and forward aid stations. Defensive Options. In general, you can go with a mobile defense or an area defense. A mobile defense is a moving battle where minimum force is dedicated to the defense. Most of the defenders are set aside as a counterattack force. To do this, the defender must have mobility equal to or greater than the opponent. The purpose of a mobile defense is to trade terrain for time, divert attention, over extend the attacker, expose a flank, or lead the attacker into a pre-planned counter attack. Light infantry cannot execute a mobile defense against a non-light infantry attacker. The other option is the area defense which dedicates a majority of its forces to retain terrain. It is mostly static and relies on interlocking fires. The area defense uses engagement areas bolstered by obstacles and fire control and distribution. The area defense is best suited to the foot mobile light infantry. Review—Characteristics of the Defense. Regardless of the type of defense, there are general rules to follow that, when ignored, lead to defeat. Look at the examples above to see the proof. Preparation – Since the defender cedes the initiative to the attacker who chooses when and where the fight will begin; he leverages the risk by hardening his position. The defender owns the turf first so he can use it to his advantage by digging in, registering his fires, and shaping the ground with obstacles. He can also rehearse on the ground and be ready for contingencies. Security – Being there first means you can over-watch the approaches with Listening Posts/Observation Posts (LP/OP’s) that provide early warning of a moving attack. Disruption – The attacker is on the move and generally needs to retain numeric overmatch. The defender can break up the attacker’s momentum and formations with obstacles and pre-planned indirect fires among other means. Mass and Concentration – The defender, as turf owner, can concentrate his forces in order to mass his fires. Flexibility – The defender attains this through: extensive rehearsals; designation of primary, alternate positions, and supplementary positions; and the careful designation and placement of reserves to execute planned counterattacks. Like any unit, the light infantry can defend from a battle position (BP), a strongpoint, or a sector. The selection depends on the mission, enemy situation, troops available, the terrain, time available, and civil considerations (METT-TC). While the BP option is frequently the easiest, it is often not the best since it concentrates light forces, making them vulnerable to indirect fires. Strongpoints have been historically successful, but they sacrifice stealth. Sectors take advantage of light stealth and all terrain capability, but they also dissipate fires—using massed effect to defeat the enemy versus massed fires. Hold the Line. The Battle Position is a common choice to make in the defense. BP’s have been around for a long time. In the World Wars and Korea, the densely packed battlefield supported the use of BP’s. Divisions were placed side by side on linear battlefields that couldn’t afford to offer any gaps to the enemy. By assigning BP’s, you know you’ve covered the ground. Let’s look at a light infantry BP defense and see why it succeeded. Little Round Top. On July 2, 1863, Union Colonel Strong Vincent, commander of the Third Brigade, sent his regiments to Little Round Top to block an incoming Confederate attack. Vincent placed the 16th Michigan to the north with the 44th New York, the 83rd Pennsylvania, to the south and ultimately; the 20th Maine on the southern end. They were the ‘end of the line’ for the entire Union Army. The commander of the 20th Maine was Joshua Chamberlain. He got his troops into position just ten minutes before the attack. Chamberlain’s orders were to hold his position on the extreme left of the Army of the Potomac at all costs. He had 385 men. The attack on Little Round Top was led by the Alabama Brigade which included the 4th, 15th, and 47th Alabama and the 4th and 5th Texas. Their orders were to take the hill. The Alabaman’s were repelled on their first assault by the first Union volley. The 15th Alabama was then sent to the south in search of the Union flank where Chamberlain’s troops waited. Seeing the threat to his flank, Chamberlain extended his line to the south; ending up in single-file to make it. He then ordered his southernmost unit to swing back after the Confederate charge. This would form a right angle on the flank, thus refusing the line by preventing a flanking envelopment. The 20th Maine took heavy losses while blocking two more assaults led by the 15th Alabama and other regiments. The back to back attacks offered little respite for an hour and a half. Chamberlain realized his men were reaching their culminating point; many were wounded and all were running out of ammunition—they couldn’t withstand another assault. He also knew that if his men were tired, the enemy would be more so since they had been attacking uphill all day. 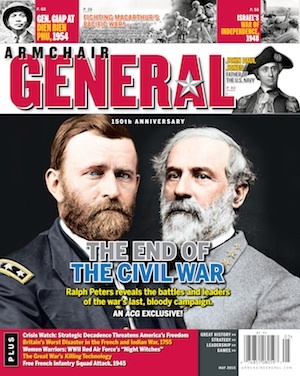 As the Confederates reassembled for the next charge, Chamberlain gave an audacious order for his left flank to advance with bayonets fixed in a “right-wheel forward” maneuver. As soon as they were in line with the rest of the regiment he ordered the entire unit to charge. Shouting ‘Bayonet’ the unit swept down the hill; swinging the door shut. The maneuver was supported by fires from Chamberlain’s sharpshooters from behind a rock wall. The simultaneous frontal and flanking assault routed the 15th Alabama and ended the Confederate pressure on the Union flank. The defense of Little Round Top succeeded due to Vincent’s placement of his brigade at the military crest of the hill. Even given the limited time, Chamberlain placed his men behind cover and he rapidly adjusted their position when he detected the enemy attempt to outflank him. Most importantly, he executed a surprising and devastating counterattack at the decisive moment. The counterattack was carefully executed and was done with withering supporting fires from the sharpshooters—he didn’t just charge down the hill. The lesson here is to use your time wisely, even in a hasty defense. Watch the enemy and respond appropriately and, most of all, be ready to counterattack as the attacker reaches his culminating point. In this case, both forces were culminating, but the one who took the initiative would be the one to win the day. Hold your Ground. The next option is one with a noble history; the defense of a strongpoint. The Alamo, Bastogne, and Khe Sanh were strongpoint defenses. The strongpoint is used when the defender possesses a formidable position that the enemy cannot bypass. It may be held to buy time elsewhere as in the case of the Alamo and Bastogne. It can also be used to draw the enemy into a series of debilitating attacks as in the case of Khe Sanh. It might also be the only option available when facing superior numbers as was the case at Rorke’s Drift. The Defense of Rorke’s Drift was fought during the Zulu War of 1879. It began immediately after the British defeat at Isandlwana on 22 January and continued into the next day. Rorke’s Drift was an outpost under the command of Lt. Gonville Bromhead of the Royal Infantry who gave up command to the senior officer on site, Lt. John Chard of the Royal Engineers. There were only a few hundred British and colonial troops at Rorke’s Drift of which only 150 could actively defend the station. They faced 3,000 to 4,000 Zulu warriors fresh off a resounding victory against a larger British force. When word reached Bromhead and Chard that the Zulus were coming, they decided to stay and fight. Chard and Bromhead quickly put their men to work fortifying the station. A defensive perimeter was built out of mealie bags (sacks of grain) and biscuit boxes. The perimeter was tied into the storehouse, hospital, and a stone kraal (an animal stable). The buildings were fortified, with loopholes (firing holes) knocked through the walls and the doors barricaded with furniture. Chard posted his infantry around the perimeter, to include patients who were more or less capable of bearing arms. The civilians and colonials with firearms defended the barricade. Natives present who were only armed with spears were posted outside the mealie bag and biscuit box barricade inside the stone cattle kraal. The Zulu attacks were massive, but piecemeal. The strength of the defensive preparations coupled with the disciplined fires of the infantry held off the Zulus. It was a close fight given the numbers, but the tiny garrison held out. The British suffered 17 killed and 15 wounded. The Zulus suffered an estimated 350+ killed and 500+ wounded. The defenders of Rorke’s Drift were awarded 11 Victoria Crosses, the British equivalent of the Medal of Honor. The defense of Rorke’s Drift was a success due to the rapid and hard work put in by the troops at the direction of their officers. The outpost went from an indefensible station in the open to a fortified strongpoint with 360 degree fires covering all approaches. Preparation was the key. Death by a Thousand Cuts. Lastly is the sector defense or the defense in depth. The German Web defense was a defense in sector. Instead of taking on the attacker toe to toe; the defender makes him run the gauntlet with blows reigning down upon him from multiple directions at different times. This sort of defense favors light infantry decentralization, stealth, and all terrain capability. A light infantry defense in sector avoids concentration of forces, thus reducing vulnerability to indirect fire. There are many examples of defense in sector, but the best comes from the 1939 Soviet-Finnish War or the Winter War. The Soviet-Finnish war began with the Soviet invasion on 30 November 1939. The Red Army possessed a vast superiority in men and materiel, but the Finns made expert use of their troops and the terrain. The Battle for Suomussalmi began when the Soviet 163rd Rifle Division fought twenty-five miles west of the Soviet border to the town by December 7th. Once there, a Finnish brigade held the 163rd, thus allowing reinforcements to arrive. The 163rd was now in trouble. The 44th Motorized Rifle Division (MRD) was sent to reinforce the beleaguered 163rd . Its advance guard was spotted on 13 December. The main body followed behind on the Raate road and was expected to arrive on the 24th. If the 44th and 163rd could link up, central Finland would fall. The Finn Commander, Col Siilasvuo, countered the threat by blocking the road six miles east of Suomussalmi. He covered the obstacle with two reinforced infantry companies and delayed the 44th MRD advance. The 44th was heavily motorized and had fifty tanks making it road-bound in the dense forest. Even the Soviet infantry was trapped to an operating range of only few hundred meters to either side of the road. This meant they could only bring a fraction of their combat power to bear at the roadblock. The Finns, on the other hand, were on skies and had built ‘ice roads’ that paralleled the main road used by the Soviets. They shadowed the Soviets all the way and harassed them at every opportunity. Their success made the 44th MRD Commander assume that he was facing a much larger force than was actually there. Worried about his own unit, he abandoned any serious attempt to rescue the 163rd Division which was destroyed by a Finnish counterattack on 27 December. The Finns dogged the 44th MRD, until 4 January, when Col Siilasvuo ordered a general attack which failed to destroy the enemy, but set the Finns up for success within days. The beginning of the end came on 6 January when a Finnish Task Force expanded the original roadblock and forced the Soviets to flee to the north right into another Task Force on the other side of the road. The retreating Soviets were hunted down in the woods; they were easy pickings for the Finns on their skies. Another Task Force cut the Raate road, establishing another roadblock. The 44th MRD was being sliced and diced into smaller and smaller bits that were easily isolated and destroyed in detail. By the evening of the sixth, the commander of the 44th ordered a retreat. He was later put on trial for incompetence and was publicly executed. The Finns cleared in sector for several days, hunting down stragglers all along the Raate road. ­— Finnish troops had mobility due to skis and sleds; in contrast, Soviet heavy equipment confined them to roads. ­— Finnish strategy was flexible and often unorthodox, for example, targeting Soviet field kitchens, which demoralized Soviet soldiers fighting in a sub-Arctic winter. ­— Finnish army had very high morale: they were defending their homes, religion, motherland and way of living against bolshevism. ­— Finnish troops’ equipment was well suited for warfare in deep snow and freezing temperatures. ­— Simplicity where needed, as the final assault was a simple head-on charge, decreasing the chances of tactical errors. Rough weather also favored comparatively simple plans. The light fighters above took different paths to victory. At Little Round Top, the light fighters were assigned a dominant position and the commander adjusted it to counter enemy shifts. Most importantly, Joshua Chamberlain sensed impending culmination and decided that a bold downhill counterattack would be decisive moment; it made all the difference. At Rorke’s Drift, the infantrymen found themselves outnumbered and surrounded. They could either flee, risking being caught in the open, or they could transform their outpost into a fortress. Bromhead and Chard went to work and built a strongpoint with 360 degree coverage. The makeshift fortress held against attacks from all sides. Finally, the Finnish light infantry faced mech and armor units possessing overwhelming firepower and protection advantages. The Finns exploited their all-terrain capability and the enemy’s road bound dependency to stop their forward momentum; chop them up into small units; and defeat them in detail. They used a large space to attack the enemy in depth and defeat them in detail. As you can see, light infantry units have many options in the defense. Leaders must consider the factors of METT-TC to select the best course of action for their troops. The common denominator to all the scenarios above is hard work. When it comes to defense, elbow grease and manpower are as critical as gun-oil and firepower. In our next article, we will leave the platoon and begin addressing the light infantry company. Your knowledge of the light infantry platoon will be valuable as we move to the company. We will study the company in much the same manner as we did the platoon. We will begin by addressing the organization of the platoon and the maneuver formations it may utilize. Future articles will focus on company offensive and defensive operations.